Published in Solution Focused Management, edited by Günter Lueger and Hans-Peter Korn, Rainer Haupp Verlag (Vienna) 2006, pages 111-119. In Solution Focused work we do not talk about emotions, but we are bringing clients in a process directly affecting emotion. Clients often experience the process of moving from a state of some frustration to appreciation. In this paper we discuss the view of emotions as personal experiences for the client, which may be correlated with Heart Rate Variability (HRV). HRV is easily measurable using sensors and computer software. During the conference session related to this paper we conducted an experiment to measure HRV during a solutions focused coaching interview, to investigate the nature of any correlation between 'solution talk' and HRV. We hypothesise that solution talk may enhance HRV, as compared with problem talk. The results from a live experiment at the SOL 2006 conference in Vienna are presented, which show significant increases in heart coherence during an SF coaching session. In Solution Focused work we do not talk about emotions, but we are clearly engaging clients in a process directly affecting emotion. Clients often experience the process of moving from a state of some frustration to appreciation. The HeartMath Institute has fifteen years experience with measuring and practising how the heart reacts in processes of frustration and appreciation. HeartMath has created a biofeedback system to measure heart coherence by making visible the rate of change of heart rate. In this article we will bridge the experiental knowledge of solutions focus with neurocardiological science to attempt to discover what happens on the physiological body level when we experience 'solution talk'. Recent research in neuroscience has resulted in a what is claimed as a more precise definition of "emotion", as distinct from "feeling". Neuroscientists Hanna and Antonio Damasio have written that "Emotions play out in the theatre of the body". By contrast, "Feelings play out in the theatre of the mind" (Damasio, 2003). First emotions are coming up, and than they can effect feelings. Emotions are visible and measurable, and feelings are hidden, like mental images necessary are, unseen to anyone other than their rightful owner, the most private property of the organism in whose brain they occur. Emotions can be visible in facial expressions, in body language, and can be heard in the voice. We can also make emotions visible with current scientific probes such as hormonal assays , electrophysiological wave patterns and heart rate variability. Feelings stay hidden, and can only be known by questioning the persons feelings. They are therefore of little conversational use, being an example of 'what we cannot speak about, we must pass over in silence' (Wittgenstein, 1961: 74). The HRV can be considered as the "language" of the heart, that can be heard each moment all over the body. HRV can be seen as an integral communication way of the body. 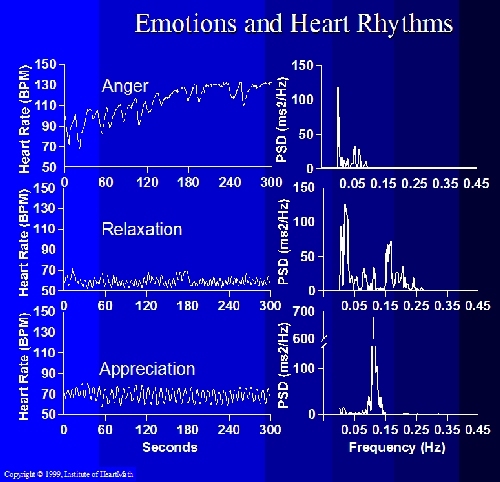 Different emotions show different patterns of the heart rhythm. 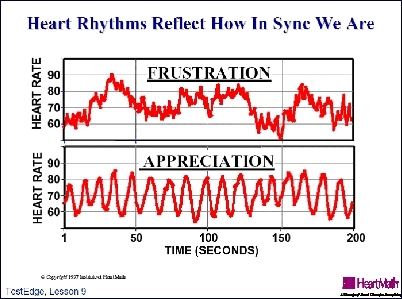 In the pictures below (Figures 2 and 3) you can see the heart rhythms connected to the emotions labelled anger and appreciation. You can see that in the case of appreciation, the HRV is changing more smoothly - it accelerates and decelerates regularly. This is called heart coherence. In anger the variability is more irregular. In frustration the pattern is even more disordered. The sympathetic and parasympathetic branches of the autonomous nervous system are out of sync with each other, battling for control over the heart rate-the sympathetic trying to speed it up and the parasympathetic trying to slow it down. Figure 2 shows an interesting, and for many people unexpected, phenomenon. Relaxation does not appear to effect heart coherence. During relaxation the heart rate is very disorderly. So this is not a simple matter of calmness equals heart coherence. The heart can be in a coherent or an incoherent state in either relaxation or arousal. So what is the significance of heart coherence? Is it beneficial? The answer seems to be Yes! Recent research results at the Institute of HeartMath (IHM) (McCraty, Atkinson and Tomasino, 2001) have shown that heart rate coordination influences the coordination of the brain's electrical activity. Furthermore, IHM studies (published in the American Journal of Cardiology, Stress Medicine and other peer reviewed journals and collected by the above authors) have shown that positive emotional states (such as love, care or appreciation) all create harmonious, coherent electrical patterns in the heart's beat-to-beat rhythms, while negative emotional states (such as stress, anger, frustration, or anxiety) all create jagged, incoherent electrical patterns in the heart's rhythms. This correlation can be measured through HRV analysis. HRV is considered by cardiologists to be a measure of autonomic nervous system balance and function. Stressful, incoherent patterns in the HRV are communicated from the heart to the brain. Conversely, harmonious, coherent HRV patterns, generated by positive emotional states, entrain the brainwaves into harmonious patterns. In addition, positive emotional states and the coherent heart rhythms they generate have been shown to increase health and have positive effects on the nervous, immune and hormonal systems. When we look on the body level of hormones we see the hormone adrenaline levels rise when there is high arousal, and decrease during relaxation. With heart coherence, we look at a different group of hormones; cortisol (the stress hormone) and DHEA(DeHydroEpiAndrosteron) known as the anti-aging homone. During heart coherence DHEA increases and cortisol decreases. As can be seen from the tables below (data extracted from McRaty, 1998), a low ratio of DHEA to cortisol is correlated with many indicators of ill health and disease. A high level of cortisol: DHEA is also linked to obesity, diabetes, hypertension, heart disease, cancer, Alzheimer's and HIV related disease (many supplementary references can be found in McRaty, 1998). The method uses a biofeedback system to measure heart coherence. You can find out more about it at www.heartmath.com. During the conference we carried out a live experiment to assess any correlations between heart coherence and solution talk. Mark interviewed a volunteer, who was wired up to an HRV measuring device running on a laptop PC. Kees supervised the measurements and helped us to interpret the data. The figure above shows results obtained during the experiment. The top graph shows the client's heart rate(varying around 70 bpm during the interview). The bottom graph shows the coherence of the heart rate variability. At the start of the interview Mark asked the client about what he would like to improve in his life (work life balance). Mark helped him to build a Platform about the kinds of things he might be wanting in a more balanced life. There were problems with the heart rate sensor at this time, so coherence was not measured during this part of the interview. Once the sensor was sorted out and measuring commenced, Mark summarised the platform and reminded the client about the things that would make for a more balanced life. This happens between 1.00 and 3.10 on the graph. During that period we see a coherent pattern of the heart rate variability appearing - similar to coherent wave pattern shown in Figure 3. In the accumulated coherence score, the line goes up in the period 1.20 to 3.00. We do not see this coherent pattern while the client was speaking, but when he listens to his own ideal moments heart coherence appears: it seems that heart coherence appears more easily while listening then while speaking. This is one good reason why it is so important that we repeat the clients' own words, so they can feel them and reflect on them. At 3.10 Mark started the miracle question. At the beginning of the miracle question, the client is thinking, maybe his mind jumps between different situations or possibilities. The classic miracle question involves waking up tomorrow and finding that a miracle has happened. This client says "This is difficult. Tomorrow is Sunday, I am still at the conference, so how can I imagine myself in a perfect future situation?" Mark's reaction was simple: tell me about your perfect Monday. The next moment the client described a quiet breakfast on Monday with muesli and a big smile appears on his face. 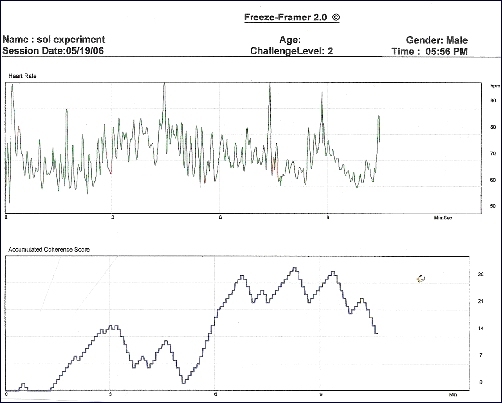 On the screen we see that the HeartRate Variability becomes coherent again: the coherence line rises in the period between 5.00 minutes to 7.00 minutes. During this time Mark only asked: "What else?". The question "what else?" and being silent for a moment are very effective tools, in which coherence can appear. We did a similar experiment in Amsterdam earlier in 2006, where we also found that silence is very important. When you ask a question, it is incredibly important to leave the other person with the question, to give time and space. The body reaction is clear: the more you create silent moments after questions.... the more coherence....the more the process deepens. A solution focussed interviewer can see it as a compliment when someone in the audience thinks that the process is slow, and yet we can see the significance of the pauses and silences. Slow down to make the process quicker. At the end Mark formulated compliments and affirms. 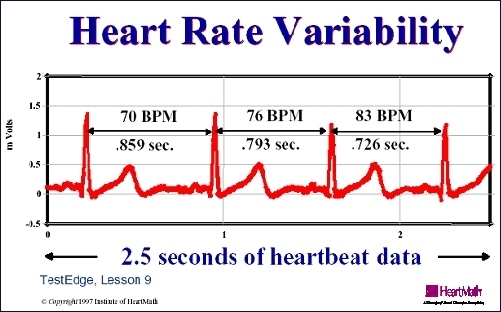 It has been known for more than ten years that appreciation creates coherence in the Heart Rate Variability, and so it is no surprise that the line goes up from 8.50 till 10.00, the end of the short interview. The heart is really touched by the solution focussed approach. During the experiment we showed, in one case at least, that a solution focused interview definitely affects the client on the body level (which might also be called the emotional level) even though emotions were not discussed. The client's building of an answer to the miracle question (the construction of a Future Perfect, in Mark's terms) increased coherence, as did the affirms at the end of the interview. The silences, pauses for thought and gentle 'what else' questioning all helped the process. what are effective questions and what less effective ones? how much silence do you need to proceed effectively? What is the most effective timing? what is the effect on coherence when you talk a lot as an interviewer? What words help and what words are less effective? what is the effect on coherence when you summarize ideal moments and when you are appreciative? We should take care to remember that 'every case is different' and to beware over-generalising. However, the present experiment has shown conclusively that any accusations of SF ignoring the emotions are very wide of the mark. McCraty R (1998). The impact of a new emotional self-management program on stress, emotions, heart rate variability, DHEA and cortisol. Integrative Physiological and Behaverial Science, Vol 33, Number 2 pp151-170. Mark McKergow: PhD MBA, consultant, speaker, trainer and author, co-author of The Solutions Focus: The SIMPLE Way to positive change. Founder of SolutionsBooks and involved in all four SOL conferences so far. He often describes himself as a 'recovering physicist'. Kees Blase, founder of the National Centre for Stressmanagement in the Netherlands - responding to teacher stress and a retreat centre for burnout. He is also a medical physicist and a trainer in human resource management, and director of HeartMath Netherlands, that aims to give the heart its rightful place in personal growth and self-management.